Please take a few moments to dwell on the first photograph, rather than dismiss it as merely a bland image of another Japanese street, free of litter and showing people going about their business in an orderly manner. View it as a photograph of time and place – two variables that have such a defining influence on our lives. Where would you rather be: the right place at the right time or the wrong place at the wrong time? Everyone in the photograph was safe in that place and time. 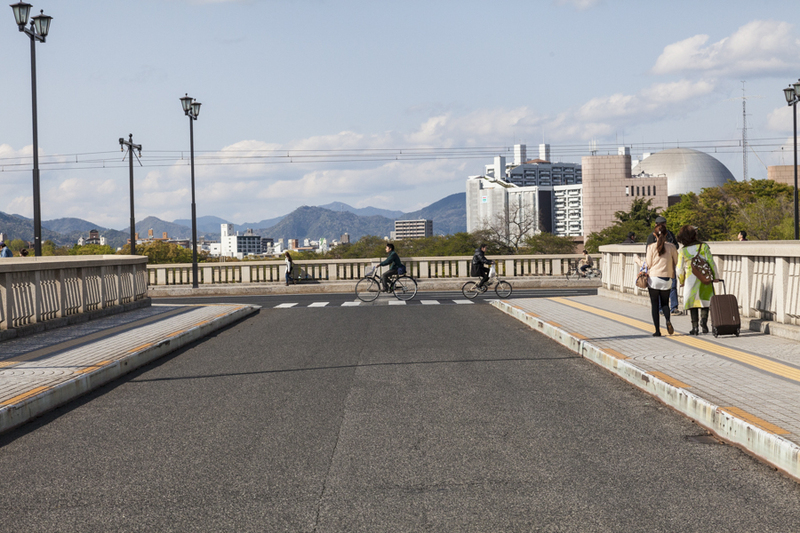 However, at the same place at 8.15am on August 6, 1945 the cyclist at the centre of the pedestrian crossing would have been the target for the bombardier on the Enola Gay, the US bomber assigned to drop an atomic bomb over the city of Hiroshima. A moment that changed the world forever! The target point was the T-intersection more clearly shown in the archival photograph at pic 2, in which, coincidentally, a cyclist is at almost the same position. Today the two bridges forming the T look much the same and it is easy to forget the historical significance of the place. However, we should not forget how significantly life changed in a blinding flash, a memory poignantly captured by a survivor’s words reproduced at pic 3. From the archival images at pics 4 and 5, one can gain a sense of the destruction, as well as identify the most enduring symbol of the event – the Dome Building. I was unprepared for my first visit to Hiroshima and the range of emotions one encounters by spending time in the proximity of the Dome Building. Despite having seen images and documentary footage and having a general understanding of the history, it was nevertheless a surreal feeling to be standing at the site of such a horrific event. Although one tries to imagine what it would have been like, this is, of course, impossible. Some things are beyond imagination. The overpowering feeling was that of sorrow and if one is honest, a feeling of guilt by association of being a national from an allied nation. This took me by surprise. History positions the bombing as a necessary evil within the overall context of an even more horrific war, an argument that can be grasped intellectually. However, when standing at the scene, humanism outweighs intellectualism. Almost seventy years later, the Dome Building (pics 6 to 16) stands as a reminder, but not the only reminder. Hiroshima continues to wear the scars in less obvious ways. The resilience of the people is commendable in the way they overcame the trauma to rebuild their city and their lives and the smiles of Hiroshima residents are the most genuine one will encounter. Nevertheless, the city presents differently to other Japanese cities. Hiroshima is playing catch-up. One does not see the obvious lifestyle signs that one sees in (say) Tokyo and Osaka; one does not see as many glitzy high-rise developments; and even in the general demeanor of everyday life, one detects a more serious approach to life – as if the mission is unfinished. In a subsequent and longer visit to Hiroshima, I became more aware of signs that the city is poised to burst free and flower again. The mission is unfinished and below the surface bubbles a subdued excitement. We must not forget Hiroshima. What happened there and at Nagasaki must never happen again and I firmly believe that awareness is the key to success. August 6, 1945 was a shocking start to the story, yet the real story is how the negative became a positive through people helping people and Japan becoming a strong advocate for peace and for the abolition of nuclear weapons. Thank you for reading this far and if the subject is of interest, there is a considerable volume of information available online and in libraries around the world. I will be staying with Hiroshima for two or three more posts and I hope you will continue to show an interest. I read somewhere a criticism that Hiroshima was just emotional tourism (or words to that effect). Well, what is wrong with that? It does not hurt us to have our senses awakened to think about important issues. Maybe history keeps repeating because we forget. Let’s not forget this time. Tags: atomic bomb, Black Border Images, Buildings, destruction, Dome Building, Enola Gay, Hiroshima, historic sites, Japan, John Liddle, johnliddlephotography, nuclear, ruins, World War 2, WW2 | Permalink. I guess the more sombre tone adopted here is a befitting one to the subject of your Hiroshima series and what this city has seen in the shadow of war crimes (from all involved, regardless of arbitrary sides drawn by those who chose personal greed over humanity). Still, I like how you have carefully related Hiroshima’s story through a lens that is more compassionate and attempts to convey what the city has undergone from multiple points of interest as compared to maintaining either one party as the perpetrator, something I feel many who do not understand might easily take up and then only to further perpetuate the suffering and fly the banner of hate, violence and even more suffering. Your writing reminds me of a valued learning point I took away from a particularly painful module (a few years ago) entitled ‘Trauma Studies,’ where most of our texts focused on the Holocaust. What I realised after a couple of weeks in class was that we were also studying how so many people (intellectuals, thinkers, poets and of course, much like everyday citizens as well) from the side that is often accused as the perpetrator were also battling their own (oft dismissed) storms, say by guilt that may even be passed down a generation or two, simply because they felt the burden of inflicting so much hurt and suffering on others even as they had not (chosen to) participate in the war crimes. It just goes to show that perhaps the best way forward, like you noted, is through awareness – of our actions that will surely have ripples of consequences over the lives of others and that we are all linked by our lives and how we choose to live them. My favourite picture this time would be Picture 8, with the fantastic burst of colour (almost bringing with it a palpable sense of gaiety) over the Dome Building that reminds us of human greed and the hurt we prove capable of inflicting on others and ourselves over and over – which brings me to your lovely closing lines above. How true. Perhaps, there is beauty in the resilience chosen by the people of Hiroshima just like all the people who valiantly continue to build their lives in any country torn asunder by war. There is so much more for us to learn – just to bring more light and hope to ourselves and everyone around us. Perhaps, keeping the conversation going – with a compassionate heart and an all-rounded perspective – as you have begun here is a great way forward. Take good care and stay well, my friend. Thank you for your insightful comments on what I believe is a most important conversation. I visited Nagasaki only briefly and don’t have enough material for a blog post. Nevertheless, it is a place I would like to visit for a few days sometime in the future.